It was Sunday September 3rd 1939 and the church service had just finished at the Chapel Royal at the lower end of North Street. Myself, Patrick Lettres and Stanley Ashford, had just changed out of our surpluses (we were choirboys) and were debating whether to go home, or have a wander around first. We had just passed the Theatre Royal in New Road when the air raid siren sounded. It was rather like the sound of an American police car that we had seen at the pictures. The rest is a trifle vague, but there were shouts from people all around us to “get under cover” and there was quite a bit of panic. Typical children, we just stood there not quite sure what to do, as there was nowhere to shelter anyway. However the problem was suddenly solved when an Air Raid Warden suddenly appeared from nowhere rounded us up and shepherded us over to the Dome where there was a shelter beneath. Amid much pushing and shoving we were finally settled down in the bowels beneath the Dome. We were told in no uncertain terms by the Warden that we shouldn’t have just stood there, and this was followed by a long lecture of the dire consequences of not seeking immediate shelter. During our sojourn in the shelter we heard numerous bangs and thumps, and our visions of Brighton being pounded into the dust were quite frightening. Finally however the “all clear” sounded and we were allowed to leave, having been given another stern warning by the Warden. Coming out into the daylight we realised our fears were unfounded and all the bangings and thumpings we heard was furniture being moved around in the auditorium above. We hurried home listening to calls from people in doorways of their houses to get indoors as soon as possible, and not venture out again. There was in fact quite a bit of mild panic until it was realised that nothing was going to happen at that moment in time. The rest of the day passed peacefully enough just listening to the news on the wireless as it was called then. September the 3rd 1939- even though only five I remember when the siren sounded my family and I were taken to the shelter in the wine cellars under the Royal Pavilion and when the all clear went we left by an entrance that opened out to the very small passage to the west of what was then Electricity House. During the early days of the raids in 1940 we regularly used the wine cellars as our shelter as they were built in two tier bunks. We used to go down early evening and be turned out about 5am. We would then go into a cafe at the bottom of Edward Street and have big mugs of very strong tea, to this day I only like very strong tea, due to this experience. 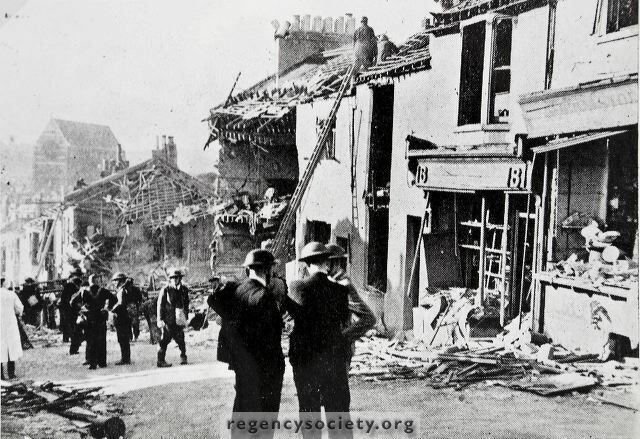 If you go to another page in the web site about White Street you can see the destruction picture of six houses in that street that happened on the night of 18th September 1940 by a parachute mine. I think the photo is actually Albion Hill, not Richmond Street. It looks to be around Belgrave or Newhaven Street,but I could be wrong? I do not think that the caption to the photograph is correct. Having lived in the area of Hanover from 1940 to the ’80s I can assure you that there was no damage to properties at the top of the hill. I say the top of the hill as this part of Richmond Street had a similar gradient to what is shown. Another point is that the view of St Ann’s is not from Richmond Street at all. To recognise a view as shown would be from the middle of Southover Street, where there were shops and numbering as displayed. I seem to remember two new houses built at about this location after the war. Ron, I think it is lower down than appears. Higher up (any of the Hanover hills) one would be looking down on St Barts, but this view is across to St Barts, so I think much further down. I lived in Scotland Street from 1979 – 1986 and know Albion Hill well, you can still tell there were small shops on every corner, unlike Richmond Street which had very few side streets. I’ve checked the 1946 Brighton Bombing Map, it shows that three bombs fell on the houses between Richmond Street and Albion Hill, the exact area is now Chates Farm Court, which I think was built in the mid to late 1970s just before I moved to Scotland Street in 1979. Probably the land was disused for over 30 years, between the bombing and the redevelopment. Looking at the old bombing map I think the affected streets running between Albion and Richmond are; Liverpool St, Dinapore St and Cambridge St. so the photo could be looking at the Richmond Street end of one of these three or the Albion Hill end of Grove St, Jersey St and Newark Pl. I think the photo is of the mid slopes of Albion Hill just above the Spread Eagle pub which I think was on the corner of Jersey Street. My grandmother lived in Liverpool street and I sometimes went to the shops, which I think are those shown. I remember standing looking at St Bartholmews across the roofs of buildings at the church instead of up as you did from London Road area and being fascinated at how close it seemed. Hi Peter, at least we can agree on one thing – it was not Richmond Street. I only suggested Southover because looking at the photo there seems to be a change in gradient to the hill. This would have been about Jersey Street/Grove Street as this would have been where the two houses were built, and out of character to the surrounding houses. I suppose we can only be certain if we can locate the Brighton Bombing Map, which may be on one of the pages on MB&H but I cannot find it. I know it was published on B&H Gazette some time after the war. Regarding the comments about the wartime bombing in Albion Hill. Take it from me the picture is of Albion Hill at the junction with Belgrave Street. I lived in Grove Street throughout the war years and saw a lot of the bomb damage in Brighton. The bombing took place just after the afternoon session at school. Check it up in Brighton Blitz, published in 1997.